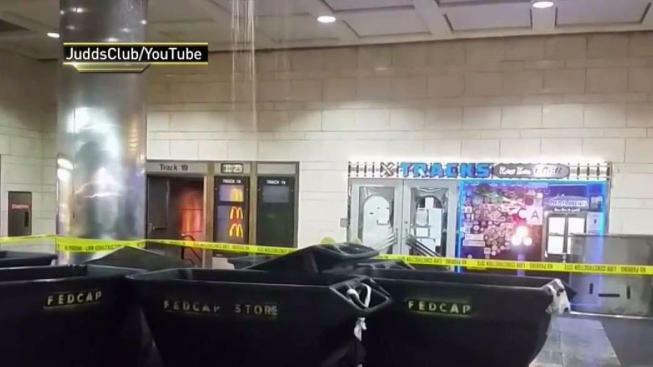 If Penn Station didn't have enough problems, sewage was pouring down from the ceiling there on Wednesday. Ray Villeda reports. Commuters have often said Penn Station stinks. Not like this. A sewage leak from 2 Penn Plaza sent sewer water raining down on the Long Island Rail Road concourse Wednesday morning, an MTA spokesman confirmed. Video posted by commuters shows water cascading from the ceiling near Track 19, close to the ticket booths. Workers from a nearby eatery were seen mopping the water away from the concourse and down the steps leading to Tracks 18 and 19. Some appalled riders held their noses in disgust; others complained of the "awful stench." "It's horrible," said commuter Todd Brown. "It gets worse and worse." The MTA said LIRR service was not affected by the leak. A spokesperson for Vornado Realty Trust, the management company for 2 Penn Plaza, confirmed the leak came from a pipe at the building and apologized for any inconvenience. No injuries were reported, the spokesperson said, adding that the situation was under control by 3 p.m. and crews were working to clean the affected area ahead of the evening rush. A trickle was still coming down from the ceiling shortly after 5 p.m.
"You pay more and more, you get less and less," Brown said. "They do what they can, but it's time for an upgrade."